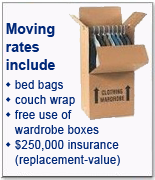 First Rate Movers is consistently regarded as one of the better moving companies in Ottawa. Our commitment to high standards of service and customer satisfaction has allowed us to enjoy complaint-free status with the BBB since 2003. This reputation has earned us and A+ rating with and recognition as an Honour Roll member of the Better Busines Bureau. © First Rate Movers Inc. - Ottawa Moving Services, 2010.